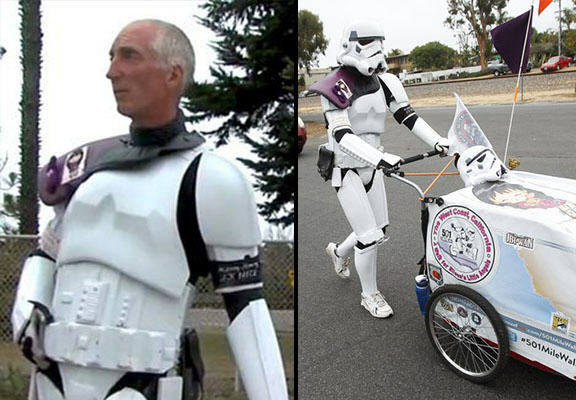 Man Walks Over 600 Miles To Comic Con Dressed As Stormtrooper To Honour Late Wife..
A man undertook the bantha task of walking 645 miles to San Diego Comic Con to honour his late wife Eileen, who was a “self proclaimed Star Wars geek”. Eileen died in 2012, shortly after she was diagnosed with pancreatic cancer. Speaking to ABC San Diego, Kevin Doyle explained how he was been “stuck” on that day so, as an act of closure, he decided to walk to the convention. His wife passed away on November 7, 2012 and Doyle said crossing back over the Golden Gate Bridge almost three years later will “symbolically be like November 8″. His journey began at Rancho Obi-Wan, the famous Star Wars museum in Petaluma, California and the walk took Doyle a month. Walking over 600 miles in full Stormtrooper armour can’t have been too pleasant, especially when the sun was shining, but it was all in the name of a good cause. Along the way, Doyle collected donations for ‘Eileen’s Little Angels’, a non-profit organisation set up after his wife’s death, which helps children with cancer who are undergoing chemotherapy. And, to the delight of everyone, the force was so strong with this one that Kevin completed his journey and even received a standing ovation from Star Wars fans at Comic Con! Amazing.